Amazing footage taken by Nestor David captured a beautiful reunion scene with an unusually affectionate condor stretching out his enormous wingspan to hug his favorite human, Nestor’s cousin Edgardo Della Gaspera. Della Gaspera had nursed this beautiful bird-of-prey back to health after falling from the nest. While the condor is fully grown flies away, he always returns to the place near Loncopué, Argentina where Della Garda first found the injured chick. 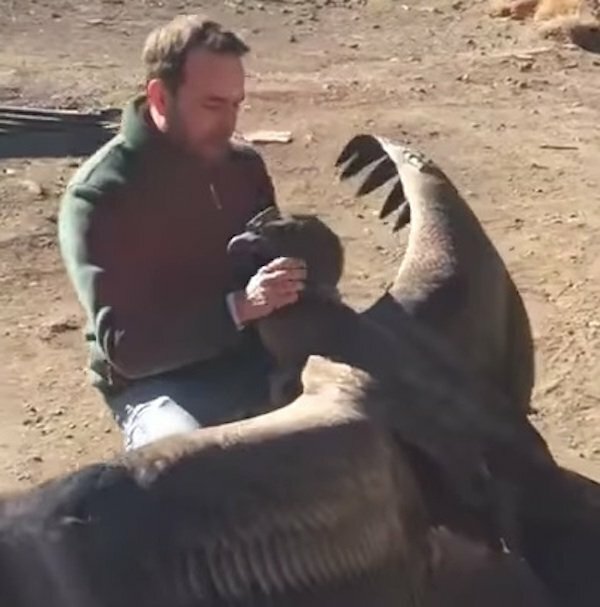 A man named Edgardo has become a viral sensation after a video showing him greeting and hugging a large condor was released. 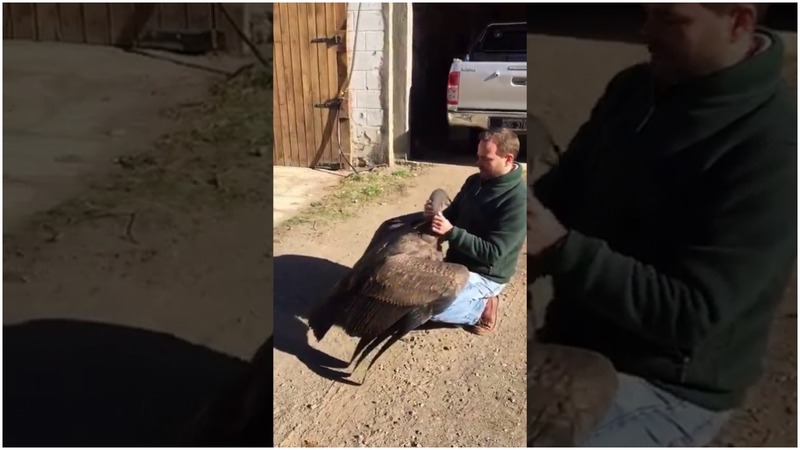 The condor comes up to Edgardo and nestles his head in the man’s arms and enjoys a neck rub. He even unfolds his wings so he can get an affectionate hug. This unlikely friendship began after Edgardo rescued the bird. The cattle rancher (estanciero) found the bird with one of his legs hurt when he was just a chick on the patio of his home in Loncopué, Argentina. He nicknamed the bird “Condorito” after a popular comic strip featuring an anthromorphic condor. “One day in March he appeared here alone and with a broken leg. We were healing him from an injury that did not seem to be serious and from that day he approaches me every time I call him,” said Edgardo to Los Andes. “When I contacted Fauna people [wildlife organization] they told me it was a male pigeon who believe that he was born in October of last year and who apparently had lost contact with his parents,” he told La Mañana de Neuquén. “Usually we leave him food to learn to look for it on his own. In recent months we have suffered the death of some animals for different reasons and we decided to leave them so that he can feed,” he said. Condorito now lives completely free in the wild, but he comes and visits his rescuer now and then to say “hello”. Staff of the Ecoparque of Buenos Aires (a zoo) wants to take “Condorito, but Edgardo opposes their offer. “They say they come to find it to take it to a suitable place, but here the condor is outdoors, in its natural habitat and recognized as his own, so we do not agree with that intervention,” he told the newspaper Neuquen. Watch Edgardo and the condor greeting one another in the video below. Next articleEvery 90s Kid Should Remember These Best Toys Ever!! Every 90s Kid Should Remember These Best Toys Ever! !